This general purpose sling with head support is to be used in conjunction with an appropriate Invacare patient lifting device to support patients with mobility disabilities and transferring difficulties. The General Purpose Hygiene sling has a buckle waist strap and features generous padding around the patients mid-section and under the arms. The sling enables easy removal of clothing for toileting. Recommended for general toilet transfers. The sling is easy to fit to a patient in bed or in a chair, providing excellent upper body and head support for the less secure patient. 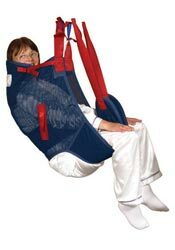 The general purpose sling has been designed to be simple and safe to use for patient lifting whether it be at home or in an aged care/nursing facilities. This sling is manufactured from polyester fabric or mesh (suitable for bathing) with internal padding in pressure areas and utilises webbing attachment loop straps or keyhole buckles. The straps are colour coded for sizing to allow easy sling selection, identification and individual client management. Available in 5 sizes – Xsmall, Small, Medium, Large and Xlarge with Safe working loads of 205-300kg.